Emerging markets heavily reliant on their extractive sectors need to step up efforts to create conducive investment environments or they will see their infrastructure sectors constrained by subdued commodity prices over the coming five-year period, a new report shows. Investment in roads and buildings has already fallen in most emerging markets where mining is a key revenue generator. 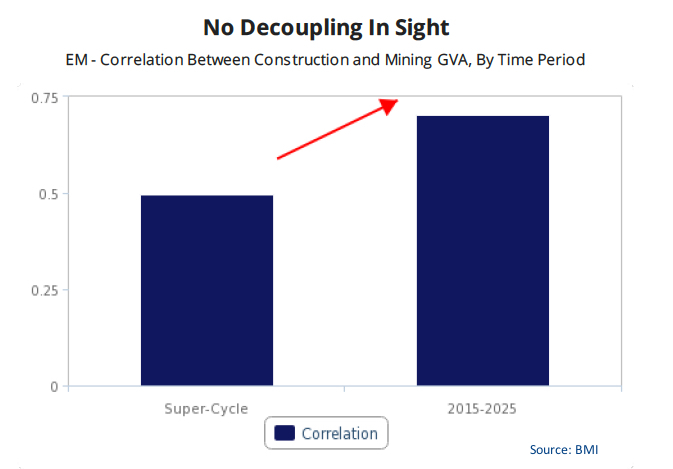 Despite some signs of an upturn are beginning to appear, most global mining companies remain uncertain as per whether to bet in new projects or wait until a recovery in prices gathers pace. Central to each miner’s decision is whether China is done being the biggest buyer of raw materials, or about to boost spending, but in more refined products, such as consumer goods. "For a lot of commodity producers, things are getting slightly better," Julian Evans-Pritchard, an economist at Capital Economics in Singapore recently told Bloomberg. "But most of the drag will still come from emerging markets next year for Chinese exports. I wouldn’t say the worst is over." BMI analysts agree. They believe that the performance of both the mining as well as oil and gas sectors will remain the main driver of investment in infrastructure in emerging-markets countries. This as governments tend to invest earnings provided by miners in infrastructure, while companies directly finance the development of their own mines and reserves. Aggregated output growth rates by sector for emerging market economies where the mining sector accounts for over 5% of GDP by output. 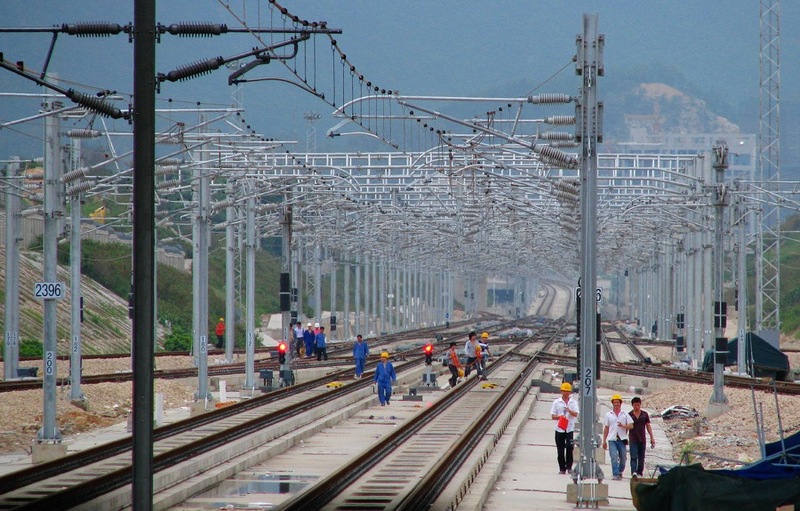 China’s growth over the past decade injected new life into emerging markets, as both companies and governments looked at boosting production, largely by opening new mines to take advantage of higher prices. Activity in the extractive sector was, a result, a key driver if not the top one when it came to investment in infrastructure. But ever since prices for metals and minerals began dropping, most dramatically from 2014 onwards, capital investment in roads and buildings has fallen in many of the emerging markets where the mining sector is a key revenue generator. 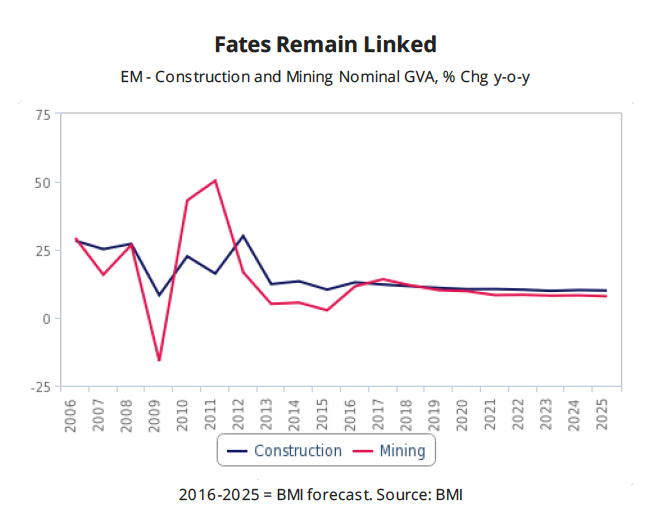 BMI forecasts infrastructure growth in those countries will continue to be linked to the performance of the mining and minerals industry to the point that if low commodity prices persist for another five years, those countries will see minimum infrastructure growth.